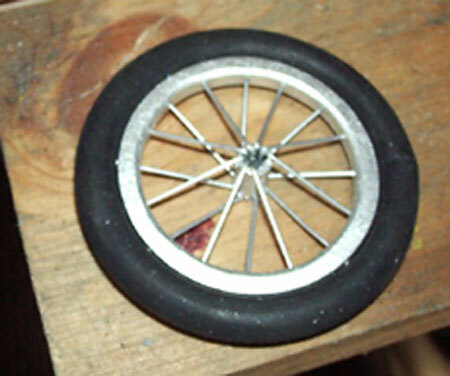 This article describes how I made a set of 16-spoke scale wheels with tires ¼" x 2½". I used materials and processes I had on hand. 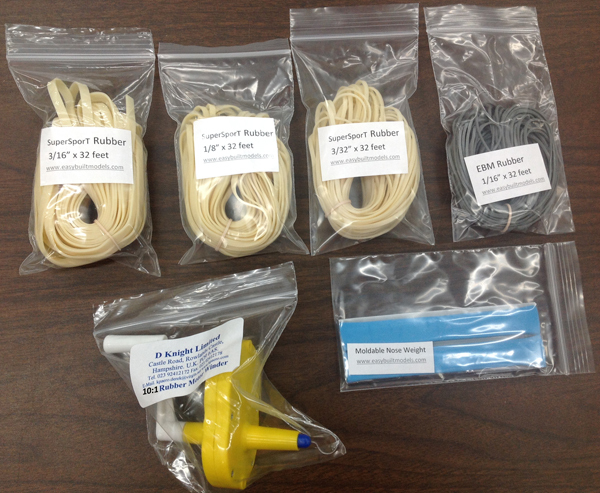 Using the right materials and dimensions, they can be scaled to other sizes. Spoke assembly is a little tedious, if not frustrating, and might require a practice session or two, but the results are worth the effort. 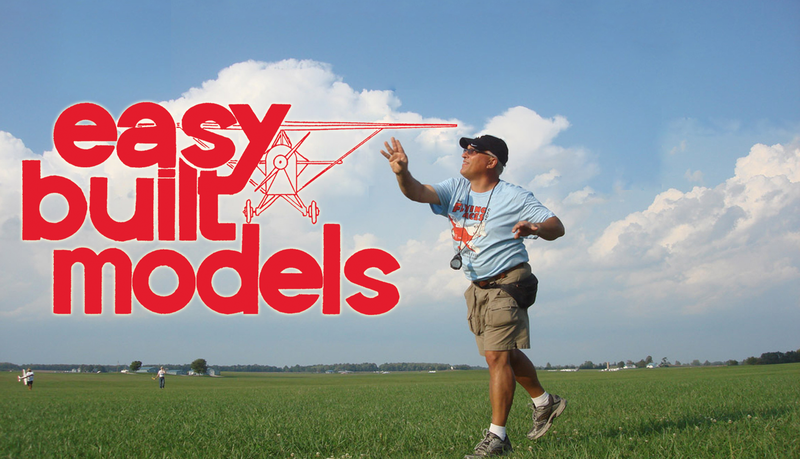 They are for display only, not flying. 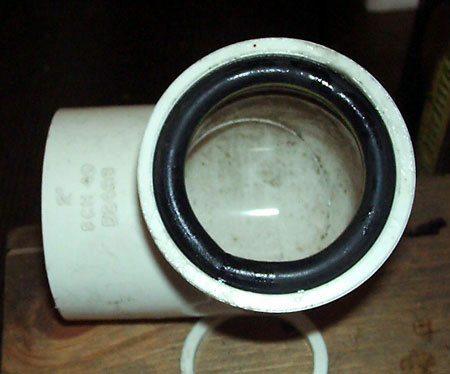 Cut a slice of 1½", inside dimension, PVC tube slightly larger than 0.2" thick for the rim. Sand to a uniform 0.2" thickness. 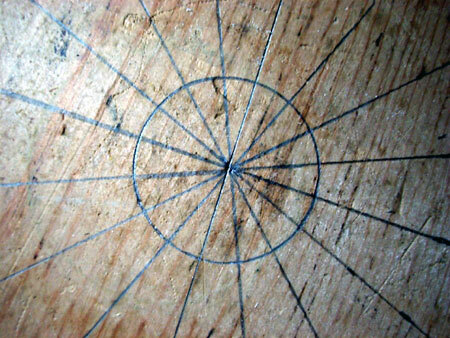 With a compass, draw a circle on a board equal to the inside diameter of the rim. 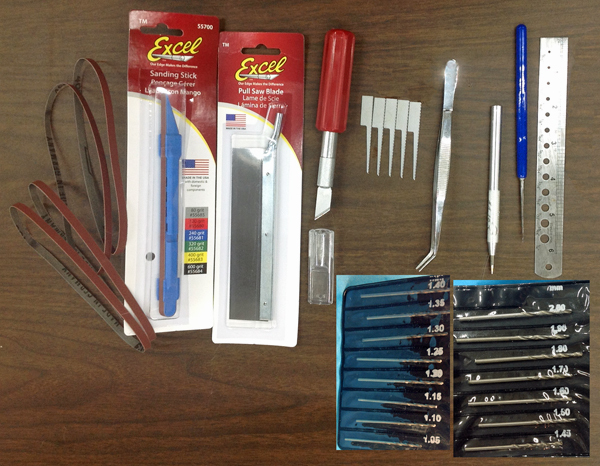 Using a protractor, construct radial lines every 22½ degrees. 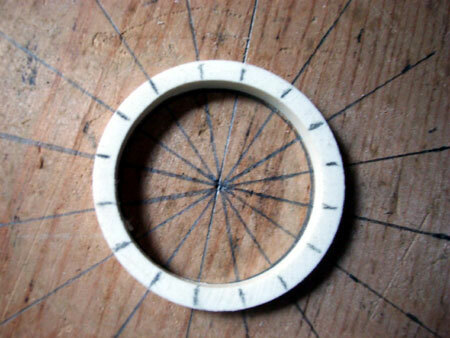 Place the rim over the circle and mark the perimeter in line with the 22½ degree marks. Mount a Dremel tool with a 0.04" (#60) drill bit horizontally, with the tip of the bit off the surface in line with the center of the thickness of the rim. 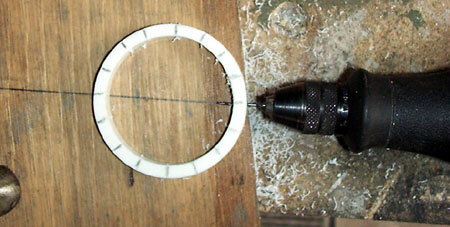 Carefully slide the rim into the bit at each marked location to drill 16 spoke holes. Keep the rim square with the bit when drilling. Bevel the inside diameter and round the edge of the outside diameter of the rim. 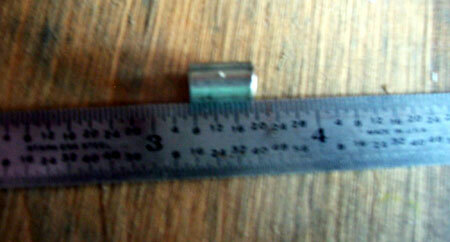 Cut 16 spokes approximately 1½" long from 0.032" music wire. Bend about 3/16" of one end of each a little over 90 degrees. Insert all 16 spokes into the rim from the inside. 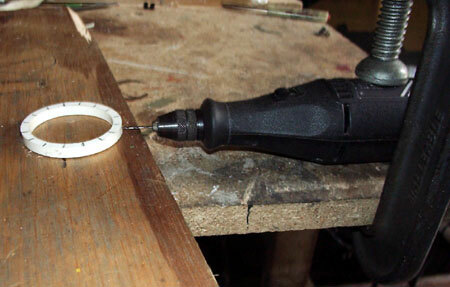 Drill a 9/32" diameter hole in a board about 1/8" deep. Set the hub in the hole and set the rim over it. 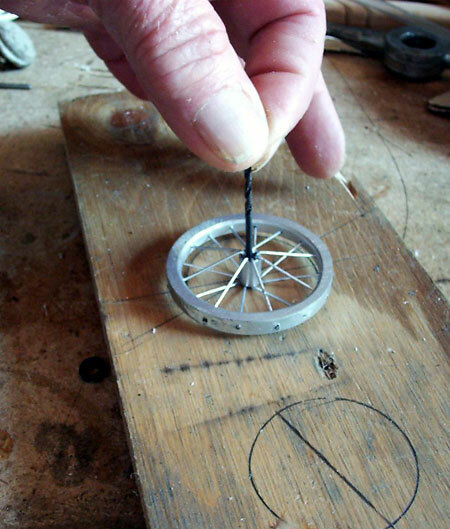 Using needle-nose pliers, hook 4 spokes spaced 90 degrees apart over the hub. 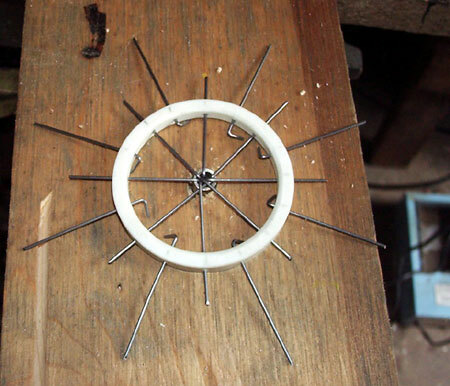 (Note that the 8 spokes on one side are all one mark (22½ degrees) from those installed on the opposite side. Pack the center of the hub with a small piece of soft rubber or a wood peg to hold the 4 spokes in place (I used a section of rubber o-ring). Pick up the assembly, turn it over and place it on another slice of the tube to hold the hub off the table. Starting with a spoke 22-1/2 degrees from one of those already installed on the other side, align it with the bend down and grasp the end at the bend with small needle nose pliers. Lift the end to clear the hub at the same time pushing the hub down against the bottom spokes and hook the spoke over the hub. IT IS VERY IMPORTANT TO PUSH THE HUB DOWN AS FAR AS POSSIBLE SO THAT THE NEW SPOKE IS NOT OVERLY STRESSED AND BENT TO CLEAR THE HUB. At this point the hub is very unstable so one hand must be used to keep it pressed down while the spoke opposite the one just done is installed. After this, the assembly is reasonably stable. Install the other two at 90 degrees to the first pair on this side, then two more across from each other at the 45 degree points on this side. Turn over, remove the hub filler material and install the remaining 4 on the first side, then over again to install the remaining 2 on the other side. 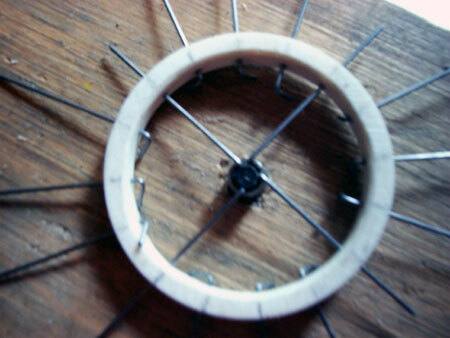 Make sure all spokes are pulled out so that the bent ends are in contact with the hub and properly positioned. 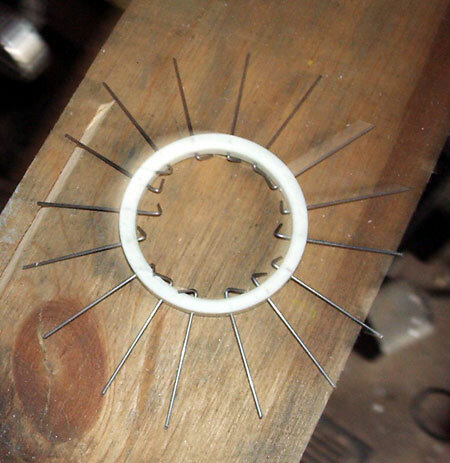 Trim the spokes with cutters. 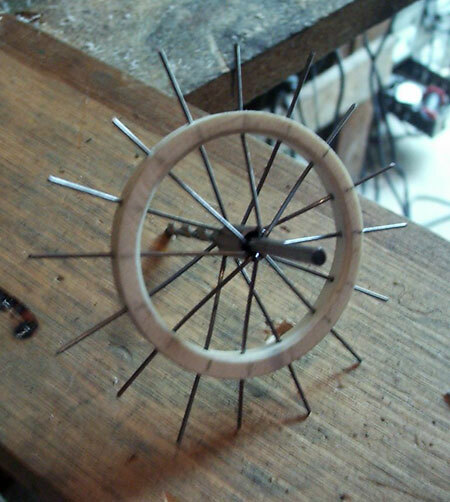 Put a shallow 0.110" hole in the center of the circle used to layout the spokes. Rest the end of the inserted drill in the hole and turn the wheel, checking for run-out against the circle on the board. Holding the hub with the drill, push the rim in the proper direction to get the hub reasonably centered. 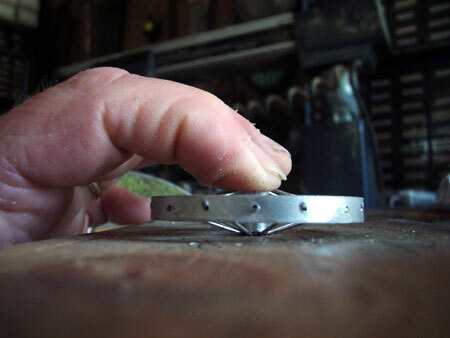 Place the wheel horizontally on a flat surface and press the hub down. Visually verify that the rim is the same height off the surface all the way around. If not, gently push the high spot down. Recheck the wheel for roundness. Paint the spokes, hub and rim as desired. Remove the axle. 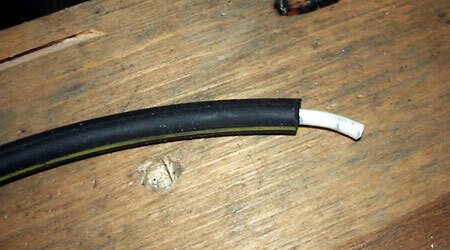 Cut a piece of ¼" automotive rubber vacuum hose 7" long for the tire. Smooth and taper the ends slightly toward the center (outer edge when installed slightly longer than inner edge.) Wrap it around the rim to check the fit and trim as necessary. Light sanding with a belt or disc sander works well for this. The fit should be tight. 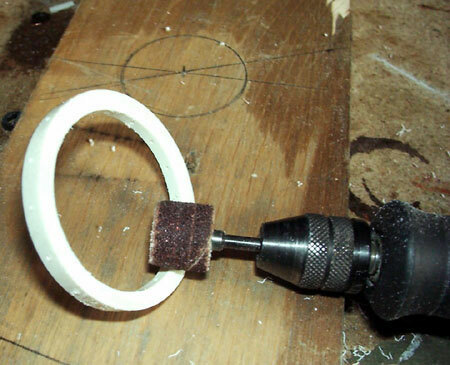 Clamp a 2" PVC union in a vise. Wipe the inside with a rag and a tiny amount of light oil to serve as a release. Mix fast setting epoxy, coat the insides of the hose ends for at least ½", coat the insert, put it in the hose and join the ends, making sure the insert bridges the gap. 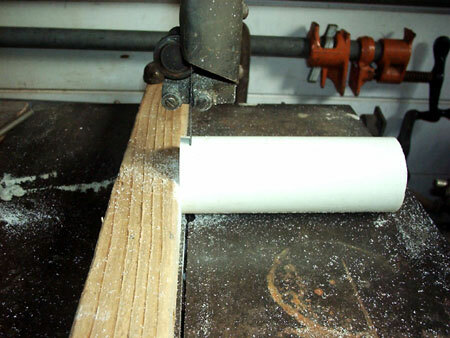 Press the tire into the bore of the PVC, align the joint and wipe off the excess epoxy. Allow the epoxy to set to full strength. Remove the tire and sand or file the joint smooth. 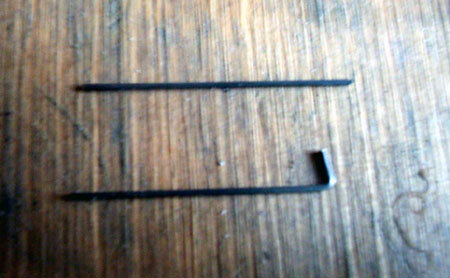 If there are gaps, they can be filled with black aquarium sealer or any other black rubber filler or adhesive. Install the tire on the rim. If the fit is tight, heat the tire in hot water first. If there is a gap between the tire and the rim at the joint, put a drop of epoxy under the tire at this point and clamp the tire and rim across the diameter until the gap closes. Let cure. There are many variations of this process possible but this should start you in the right direction. View this article in easy-to-print pdf format.